At launch we talked about the “accessory spine” and hinted at future peripherals that can click in and do more. Those connectors look like can carry more current than the pogo pins, don’t they? This strongly implies that it’s technically possible to charge Surface through the connector for the Touch and Type Covers, which would open the door for future keyboard covers with some sort of integrated battery. Update: The Verge points out that the Surface Pro has some additional connector plates compared to the Surface RT, so if those future accessories ever materialize Surface RT owners (like me!) might be out of luck. I have no reason to doubt Cook and Schiller when they say the A6X is a better chip, that it puts the iPad’s performance even further ahead of its competition. All without a single benchmark or other type of objective assessment. Pulled directly from the leaked Windows 8 RTM. Preview of what you’re getting. MediaFire mirror. The event which should give us the first look at Windows Phone 8 will be streamed live on Channel 9. We’ll also be live blogging it on WMPoweruser (Andrew Bares is reporting on the ground in San Francisco). Stay tuned, the event starts at 9:00am PT (6:00pm CEST), or in about an hour. Update: Here’s our live blog on WMPoweruser. This is just too awesome. Civilization III, IV and V are long out, but this guy’s been playing the same game of Civ II for ten years. The game is now in 3991 AD and whether intentional or not, the late-game seems surprisingly “well-balanced”, having become a dystopian mess eerily reminiscent of George Orwell’s 1984. Definitely worth a read (and look). After messing around with different styles for way too long, Microsoft has finally rolled out what seems to be like a proper redesign for its Bing search engine (only the US version for now, sadly). 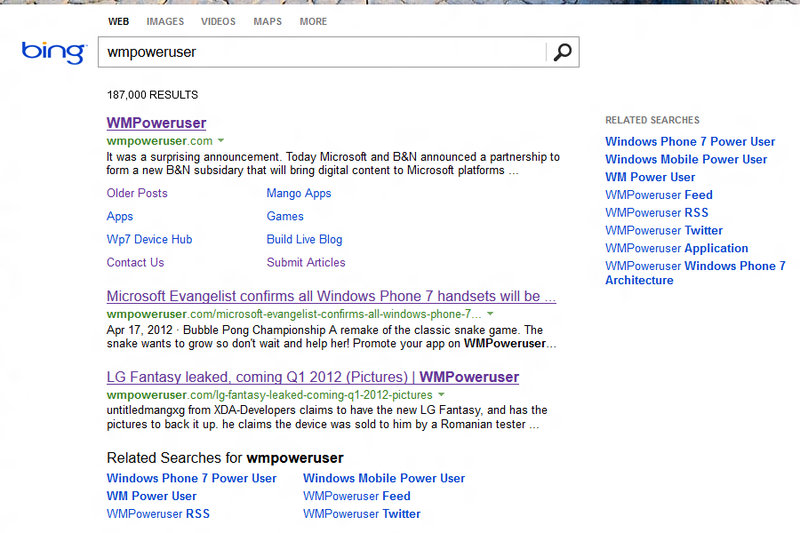 Only the search results page has been changed, though – the new tiles on the homepage apparently didn’t make the cut. This is how the new design looks like. It’s much cleaner, I really like it. It’s a little bare bones but that’s nothing bad for a search engine. Hopefully they’ll add the fly-out previews back in; after all, Bing came up with this functionality first, and then Google copied/perfected it. I’m just shocked, I haven’t seen anything yet [in Windows Phone] that isn’t more beautiful than the other platforms. That would be really nice. I used to have Flashblock installed, an addon that blocks Flash by default and lets you activate it with a click. However, sometimes the Flash element simply refused to load after clicking, and the placeholder image was pretty ugly. Hopefully a native solution will work better. Reading Chinese forum posts is hard. While I do speak Chinese, I don’t know Chinese internet slang since I mostly read English (even more than German) on the internet. Anyway, the full story is linked through the title. All but confirmed now. The Next Web says it will launch next week, with 5 GB of free storage, and TechCrunch has dug up the Mac client from Google’s servers (although it doesn’t work yet, obviously). This space is getting really interesting. Microsoft is revamping SkyDrive to support file syncing like Dropbox (Live Mesh does the same but is extremely poorly integrated), and Google Drive will also have apps for Windows, Mac, iOS and Android. I don’t think there needs to be one clear winner – all solutions have their unique strengths. SkyDrive and Google Drive would be tied into their respective ecosystems, while Dropbox remains the true cross-platform solution with more sophisticated features (like file history). A South African man, whose name has not been published, was carjacked, robbed, and stuffed into the trunk of his car near Johannesburg on Sunday. The robbers, however, had overlooked his mobile phone, which he used to text his girlfriend, Lynn Peters. From there, Twitter took over. At 10,000 incidents a year, there would have been, on average, 26 other kidnappings that day that didn’t receive this kind of attention. The internet is a fickle master. Everyone seems to be getting a different Bing interface. There’s the regular version, unchanged for almost two years during which Google has made huge improvements, a home page with tiles (which I’m getting as well), and a proper Metro-style version. It’s a confusing mess. Hopefully Microsoft will roll out a real redesign in time for Windows 8. And a third have already done so, according to a survey of British workers. It’s a bit old now (kept it around as a browser tab before finally getting to read it today) but a good read nonetheless. If you don’t know who FAKEGRIMLOCK is… he’s the internet’s most awesome giant robot dinosaur, always tweeting interesting stuff about tech and commenting on blogs like AVC.